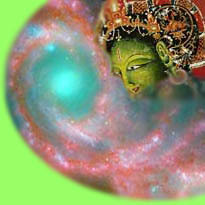 The fifteenth homage is to Rabtu Zhima,Tib the “Perfect Pacifier”, who pacifies the obscuration of negative karma1. She sits on blue lotus, and is peaceful. Her color is white like a crystal moon and she holds an anointing vase. She is free from the fruition of suffering, and as a result, she is blissful She has eliminated non-virtue, and as a result, she is virtuous. Her afflictions have ended, and as a result, she is tranquil. She has gone beyond the sufferings of the two obscurations and she enjoys and abides in the sphere of sublime tranquility. By her power of compassion, and power of reciting perfectly in accordance with the sādhana2 her twenty-three or eighteen syllable mantras, the five heinous negative karmas3 that make beings fall into the lower realms, and other karma that generates great sufferings are uprooted and purified. The mantra includes the additional syllables, OṂ at the beginning and SVĀHĀ at the end. The ultimate meaning is that her blissfulness and other qualities are connected to the five wisdom minds: the wisdom of absolute space, mirror-like wisdom, the wisdom of equality, discriminating wisdom, and all-accomplishing wisdom. 1 karma skt ~ The doctrine of actions and there causal consequences, the law of cause and effect. 2 sādhana skt ~ Translated as “means of accomplishment” Usually is a complete set of tantric liturgies on the practice of a deity, starting from the lineage prayers to dedication of the merit to all the sentient beings. 3 five heinous negative karmas ~ Patricide, matricide, killing an arhat, drawing blood from the body of a Buddha with evil intent, and causing a schism in the saṅgha.